Communicating research more broadly is not only important for outreach to the public, but with the rapidly expanding literature, we think it’ll also be important for communicating to other scientists. Back in 2012 we started a post type called [Research Summary] which is based on the idea that people might not have time to read a multi-page paper but might be willing to read a <1000 word post conveying the ideas in the paper in a more casual format. Ethan did one of these for an Ecology paper his group published last year. Below, one of our graduate students, Sarah Supp, has taken up the challenge to communicate about her first-authored Ecology paper that just came out and has written the guest post below. While many ecologists focus on why individuals, species, or ecological habitats differ, macroecologists are often fascinated by similarities among different groups or ecosystems. This focus on similarities emerges because macroecologists treat individuals, populations and species as ecological particles, and identify patterns in the structure of these particles to understand ecological systems and organization. Despite a long history of documenting macroecological patterns, an understanding of what determines pattern behavior, why patterns are so easily predicted by so many different models, and how we should go about addressing real ecological problems using a macroecological approach has still not been reached. Three common macroecological patterns, and the focus for our study, include: the species abundance distribution (SAD; distribution of abundance across species), the species-area relationship (SAR; accumulation of species across spatial scales), and the species-time relationship (STR; accumulation of species through time). Since these patterns exhibit regular behavior across taxonomic groups and ecological habitats, they are increasingly being used to make inferences about local-scale ecological processes and to inform management decisions. Recently, discussion on how to do ecology has sometimes presented a dichotomy between two groups: “species identity matters” vs. “species identity is unimportant”. A more useful way of discussing the problem likely lies in asking more nuanced questions such as: How important are species identities for my specific question? When does species identity impact ecological organization? At what spatial/temporal scales? When are species identities necessary for prediction? For example, recent models suggest that the identity of species within a community or ecosystem is unimportant for predicting the shape of macroecological patterns. Instead, these models suggest that some macroecological patterns may only be sensitive to changes in the species richness or total abundance of the ecosystem being examined. This idea is pretty radical (in our opinion), but untested. We took an approach that we felt could address a few problems simultaneously: 1) Does species identity play a role in determining the form of macroecological patterns, or are patterns only sensitive to changes in species richness or total abundance? 2) Can we effectively synthesize our detailed knowledge of a system with a macroscopic approach in order to link pattern with process? 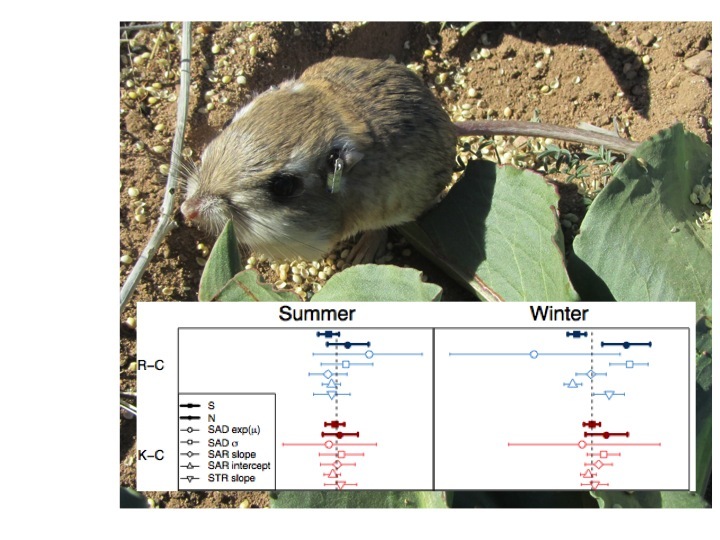 We used 15 years of data from the Portal Project, our lab’s long-term research site in southeastern Arizona, to evaluate the response of the summer and winter annual plant communities to selective removal of rodent seed predators. It is not known if altered species identity alone (changes in species composition caused by manipulating an important interaction, seed predation [above]) can lead to shifts in the form of these patterns, in the absence of other changes (such as species richness and total abundance). At the Portal site, interactions within and among rodent and plant communities are well studied and we felt that this made our site an ideal experimental venue for this project. 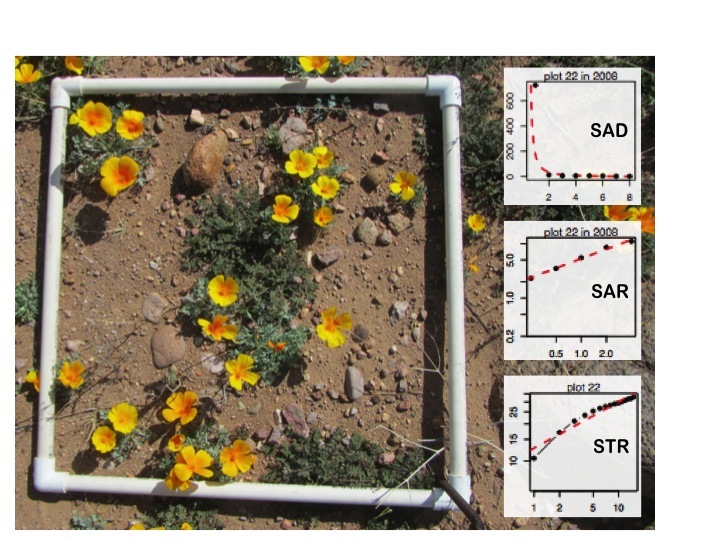 Among experimental treatments (control, kangaroo rat removal, and removal of all rodents), we compared changes in plant species composition, species richness (S), total abundance (N), and the form of each of the macroecological patterns (SAD, SAR, and STR). Below are examples of the data for each pattern from plot 22, a control plot, and a photo of a plant sampling quadrat. In the photo, California poppy (Escholtzia mexicana) and Stork’s bill dominate (Erodium cicutarium). Example of sampling quadrat and observed empirical patterns from a specific experimental plot in 2008. 1) Does species identity plan a role in determining the form of macroecological patterns, or are patterns only sensitive to changes in species richness or total abundance? Our research suggests that the key to interpreting and predicting patterns lies in our ability to make realistic predictions of community level variables, such as species richness or total abundance. Although changes in species richness or total abundance were most the important predictors for change in our macroecological patterns, we are not suggesting that changes in species identity are inconsequential. In fact, we believe that our findings suggest an important, but indirect role, for the role of species interactions in determining macroecological patterns. Species interactions may facilitate or hinder compensation dynamics, which in turn may lead to shifts in the number of species or the total number of individuals in response to manipulation. In a recent paper, Brian McGill suggests that what drives S and N is a central unanswered question in ecology. 2) Can we effectively synthesize our detailed knowledge of a system with a macroscopic approach in order to link pattern with process? We feel that our approach of using small-scale experimental field data with macroecology (which has largely relied on large-scale observational data) provides a potentially powerful framework for improving our understanding of the linkages between pattern and process. Studies using a similar approach may help bridge important gaps between pattern and process, between local and regional scale ecology and between basic and applied science.